Pneumonia is an inflammation of the air sacs in the lungs (alveoli) and the surrounding tissue. It often leads to a sudden high fever, the feeling that you are very unwell, a cough and shortness of breath. Because pneumonia is usually caused by bacteria, it can generally be treated effectively with antibiotics. Vaccinations that can prevent infection by certain germs are also available. People who are otherwise in good health generally recover within a few weeks. But pneumonia shouldn't be taken too lightly: it can last one or sometimes even several months until you are back to full strength. Pneumonia may sometimes have life-threatening complications, especially if you have already been weakened by another illness. Pneumonia can also be dangerous for babies and older people. The symptoms don't always all occur at the same time. Particularly children and older people may not show some symptoms, or other, less typical symptoms such as diarrhea, stomach pains or drowsiness and confusion might be more noticeable. Pneumonia: What needs to be considered in children? Pneumonia: What needs to be considered in older people? Pneumonia is usually caused by bacteria – and most frequently by bacteria called pneumococci. Sometimes, other types of bacteria such as Haemophilus influenzae or Mycoplasma pneumoniae are also involved. If you develop pneumonia in the hospital, it's often caused by an infection of bacteria that are harder to treat. If the airways are already infected by other germs, for example flu viruses, it's easier for the bacteria to grow there. This can result in bacterial pneumonia. It's less common for pneumonia to be caused by viruses alone. Pneumonia caused by fungi is even rarer. That mainly occurs if the immune system is especially weak, for example due to AIDS. The germs enter the lungs when tiny droplets of saliva or water are inhaled (droplet infection). But people can also become ill because they swallowed the wrong way. Then germs from the mouth and throat, and food residue or material from the stomach can enter the airways and lead to pneumonia. The medical term for this is aspiration pneumonia. Only rarely does a bacterial infection spread through the bloodstream from elsewhere in the body to the lungs. Pneumonia caused by things besides germs, such as radiation, inhaled poisonous substances, allergic reactions or circulation problems in the lungs, is also rare. The risk of developing pneumonia is particularly high in babies and older people (over 65 years). A weakened immune system, for example due to diabetes, kidney problems or cancer, also means that the risk is higher greater. 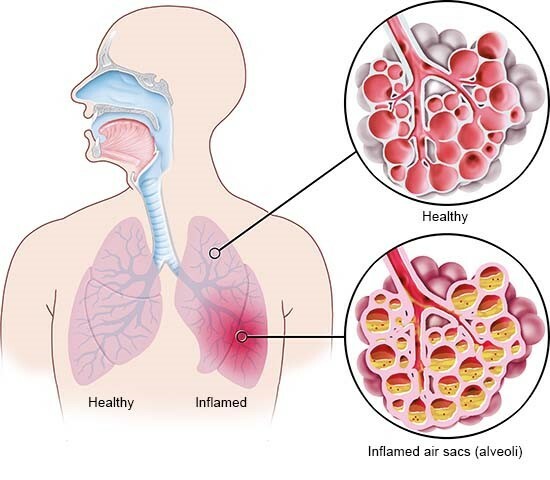 Lung diseases such as asthma and COPD, heart diseases, smoking and certain viral infections such as the flu (influenza) can make people more prone to pneumonia. The risk of aspiration pneumonia is especially high in people who are bedridden or affected by confusion or difficulties swallowing due to dementia or stroke, for instance. Some medications are also linked to pneumonia, such as medicines that reduce the level of acid in the stomach. But it's still not clear whether they actually increase the risk of pneumonia. Pneumonia is common, especially in poorer countries. There, infants and children are most often affected. Over 500,000 people develop pneumonia each year in Germany, with about 250,000 of them receiving treatment at a hospital. A total of 20,000 people die of pneumonia, especially older people over 65 and people who have been weakened by other diseases. That makes it one of the top ten causes of death in Germany. The typical signs of pneumonia are a sudden high fever and chills. People with pneumonia start to feel very ill within just a few hours. Symptoms such as a cough with phlegm and shortness of breath are also typical. But it may develop gradually and start with few or only mild symptoms, particularly in older people. Left untreated, the fever lasts for about one week. Body temperature then goes back down to normal levels. That can also be accompanied by profuse sweating. The blood vessels in the skin also become wider so that the body can give off excess heat. That can put a lot of strain on the heart and circulation of someone who has already been weakened, though. So complications during this phase are not uncommon. Once this phase has passed, general wellbeing gradually improves and pneumonia usually subsides completely after about four weeks. But you may still feel run-down and tired for quite a while, and the cough can also be persistent. Nowadays, though, it's not common for pneumonia to take this course because it's usually treated immediately. Taking antibiotics usually makes the fever go away more quickly, and helps you to feel better faster. Nevertheless, it's important not to start doing too much too soon after having pneumonia. Otherwise, it may come back or lead to other complications. Pneumonia can lead to inflammation of the lining that covers the lungs (pulmonary pleura). That causes severe pain when you cough or breathe. Fluid can also collect between the lungs and the chest wall, which makes breathing even more difficult. Another possible complication is a lung abscess, the formation of a pus-filled space in the lung. were already treated with antibiotics in the months before you developed pneumonia. 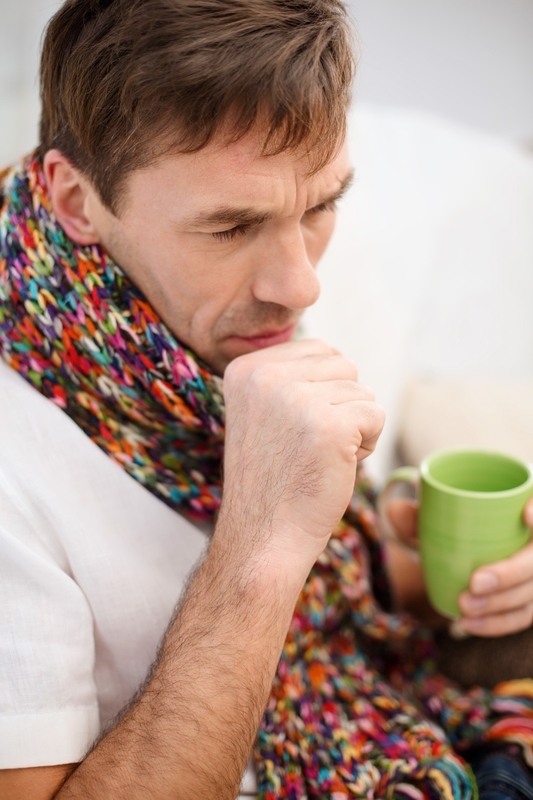 Pneumonia can often be diagnosed based on its typical symptoms. In a physical examination, the doctor listens carefully to the lungs using a stethoscope and measures your pulse and blood pressure. An x-ray of the lungs is usually taken, too. The x-ray can show where and how much of the lung tissue is inflamed, for example. A more involved x-ray exam, a CT scan, is sometimes needed. Changes to the outer regions of the lungs can also be seen using ultrasound. Blood is also taken to measure the level of inflammation, for example. Because the inflamed lungs no longer work as well, it may be necessary to check the oxygen content of the blood. That can also be done without taking blood using what is known as pulse oximetry, where a clip with a light sensor is placed onto one of your fingers to optically measure the oxygen content. Blood, urine and coughed up mucus (phlegm) can be tested in a laboratory to find out exactly which germs caused the inflammation. Generally, practicing personal hygiene, like regularly washing your hands, is the best way to prevent respiratory infections. Vaccinations are also recommended for people who have an increased risk of pneumonia or its complications. For example, children can be vaccinated against the Haemophilus influenzae bacteria and pneumococci. Flu and pneumococci vaccinations are also suitable for people over 60 years of age. Herbal medicines and dietary supplements such as vitamin products are often said to strengthen the immune system. But there are, no studies that prove that such substances are worth it – except for people who have a diagnosed vitamin deficiency. That usually only occurs in Germany or similar countries as a result of a very imbalanced diet. Because the infection is usually bacterial, pneumonia is typically treated with antibiotics. The appropriate antibiotic depends on the type of bacteria. Treatment lasts about 5 to 7 days. The antibiotic can be taken as a tablet or syrup. Depending on the severity of the illness and the risk of complications, treatment in a hospital may sometimes be needed. The antibiotic is usually given as an infusion there. Some people with severe pneumonia are also given a steroid injection. Inhalation of oxygen using a mask is sometimes necessary; artificial respiration is less commonly needed. If the pneumonia was caused by viruses, other drugs are needed, like a virostatic against flu viruses. Cough medicines from the pharmacy, special breathing exercises or physiotherapy aren't recommended for treating pneumonia. How are different types of pneumonia classified? What happens if you get pneumonia in the hospital? Almirall J, Serra-Prat M, Bolibar I, Balasso V. Risk Factors for Community-Acquired Pneumonia in Adults: A Systematic Review of Observational Studies. Respiration 2017; 94(3): 299-311. Chang CC, Cheng AC, Chang AB. Over-the-counter (OTC) medications to reduce cough as an adjunct to antibiotics for acute pneumonia in children and adults. Cochrane Database Syst Rev 2014; (3): CD006088. Chaves GS, Fregonezi GA, Dias FA, Ribeiro CT, Guerra RO, Freitas DA et al. Chest physiotherapy for pneumonia in children. Cochrane Database Syst Rev 2013; (9): CD010277. Deutsche Gesellschaft für Pädiatrische Infektiologie (DGPI), Gesellschaft für Pädiatrische Pneumologie (GPP). S2k-Leitlinie „Management der ambulant erworbenen Pneumonie bei Kindern und Jugendlichen (pädiatrische ambulant erworbene Pneumonie, pCAP)“. AWMF-Registernr. : 048-013. March 2017. Deutsche Gesellschaft für Pneumologie und Beatmungsmedizin (DGP). S3-Leitlinie: Behandlung von erwachsenen Patienten mit ambulant erworbener Pneumonie und Prävention – Update 2016. February 15, 2016. Eppinger M, Müller M. Pädiatrie für Studium und Praxis. Breisach: Medizinische Verlags- und Informationsdienste; 2016. Hemilä H, Louhiala P. Vitamin C for preventing and treating pneumonia. Cochrane Database Syst Rev 2013; (8): CD005532. Herold G. Innere Medizin. Cologne: Self-published; 2017. Horita N, Otsuka T, Haranaga S, Namkoong H, Miki M, Miyashita N et al. Adjunctive Systemic Corticosteroids for Hospitalized Community-Acquired Pneumonia: Systematic Review and Meta-Analysis 2015 Update. Sci Rep 2015; 5: 14061. Kasper DL, Fauci AS, Hauser SL, Longo DL, Jameson JL, Loscalzo J. Harrison's Principles of Internal Medicine. New York: McGraw-Hill; 2015. Lambert AA, Lam JO, Paik JJ, Ugarte-Gil C, Drummond MB, Crowell TA. Risk of community-acquired pneumonia with outpatient proton-pump inhibitor therapy: a systematic review and meta-analysis. PLoS One 2015; 10(6): e0128004. Lux LJ, Posey RE, Daniels LS, Henke DC, Durham C, Jonas DE et al. Pharmacokinetic/Pharmacodynamic Measures for Guiding Antibiotic Treatment for Hospital-Acquired Pneumonia. November 2014. (AHRQ Comparative Effectiveness Reviews; Volume 136). Marti C, Grosgurin O, Harbarth S, Combescure C, Abbas M, Rutschmann O et al. Adjunctive Corticotherapy for Community Acquired Pneumonia: A Systematic Review and Meta-Analysis. PLoS One 2015; 10(12): e0144032. National Institute for Health and Care Excellence (NICE). Pneumonia: Diagnosis and Management of Community- and Hospital-Acquired Pneumonia in Adults. December 03, 2014. (NICE Clinical Guidelines; Volume 191). Robert Koch-Institut (RKI). Empfehlungen der Ständigen Impfkommission (STIKO) am Robert Koch-Institut – 2017/2018. August 14, 2017. (Epidemiologisches Bulletin; Volume 34). Siemieniuk RA, Meade MO, Alonso-Coello P, Briel M, Evaniew N, Prasad M et al. Corticosteroid Therapy for Patients Hospitalized With Community-Acquired Pneumonia: A Systematic Review and Meta-analysis. Ann Intern Med 2015; 163(7): 519-528. Statistisches Bundesamt (Destatis). Häufigste Todesursachen 2015. March 10, 2017. Stern A, Skalsky K, Avni T, Carrara E, Leibovici L, Paul M. Corticosteroids for pneumonia. Cochrane Database Syst Rev 2017; (12): CD007720. Weltgesundheitsorganisation (WHO). Pneumonia. September 2016. Yakoob MY, Salam RA, Khan FR, Bhutta ZA. Vitamin D supplementation for preventing infections in children under five years of age. Cochrane Database Syst Rev 2016; (11): CD008824. Yang M, Yan Y, Yin X, Wang BY, Wu T, Liu GJ et al. Chest physiotherapy for pneumonia in adults. Cochrane Database Syst Rev 2013; (2): CD006338.